As most of you know, my clocks mainly come from eBay filed under “For Parts or Repair” and that’s the way I like them. 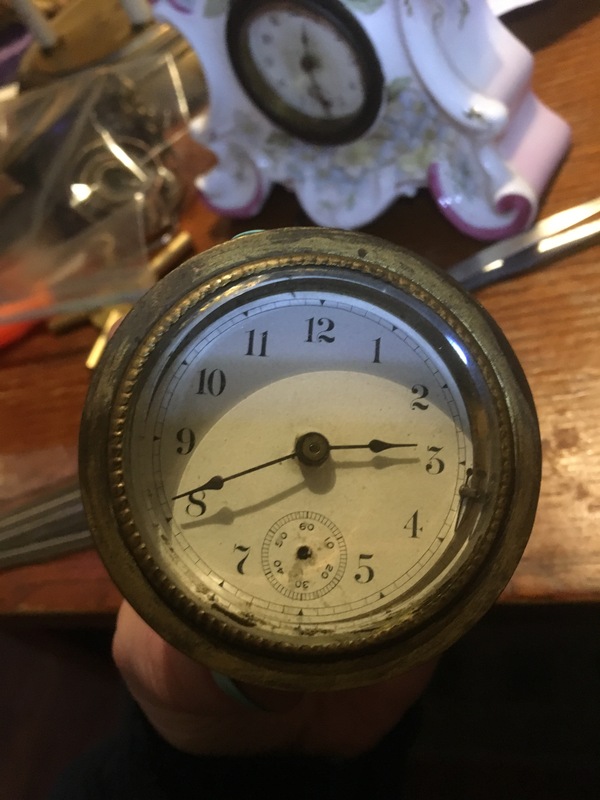 I’m still firmly in the learning stage and while I can do minor work on quality clocks I generally stick to toss away clocks that no one cares for but myself. 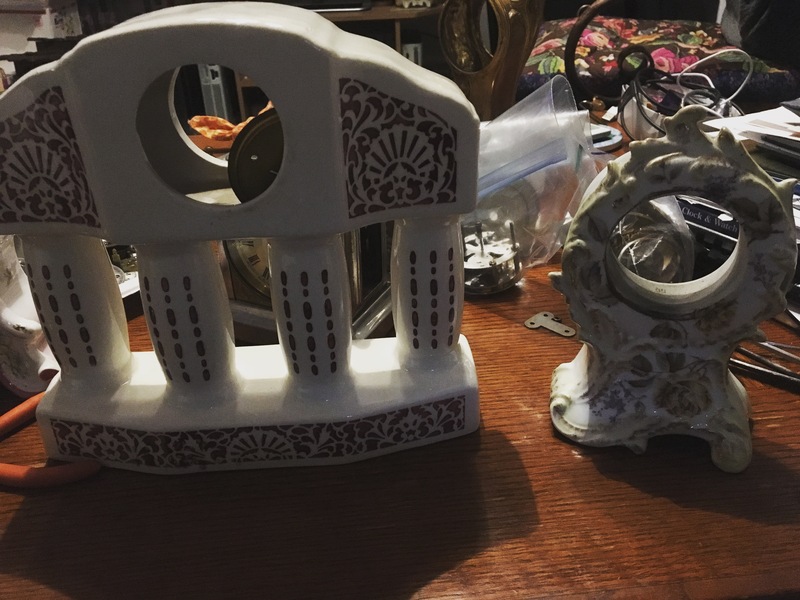 So I was hyped to find a great deal on two ceramic clocks that have just the kind of small circular movement that I wanted to practice on. One of those cases is shown in the picture below, to the right. Not being overly fond of the case (no offense to those who are) I was thinking of switching the clock to the left case when I got it working. Unfortunately that may not be as easy as I had hoped. I poked and prodded and everything seemed fine except for an overly wound spring. The clock was even pretty clean, with the exception of a badly done gold paint job on the rim of the dial. I had some difficulty keeping the balance spring in place, but not so much that I thought it was unfixable. Once I took it apart, unwound the spring, and put it back together, I was faced with a quandary. 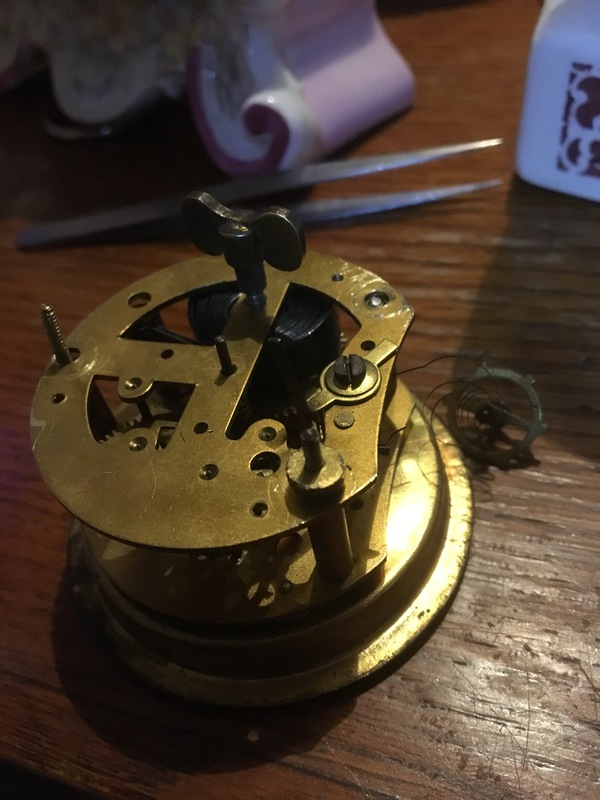 I didn’t know why the clock wasn’t running, especially because the escapement and balance spring weren’t in place to keep the clock from running out of control. So I took it all apart and put it back together again – still nothing. 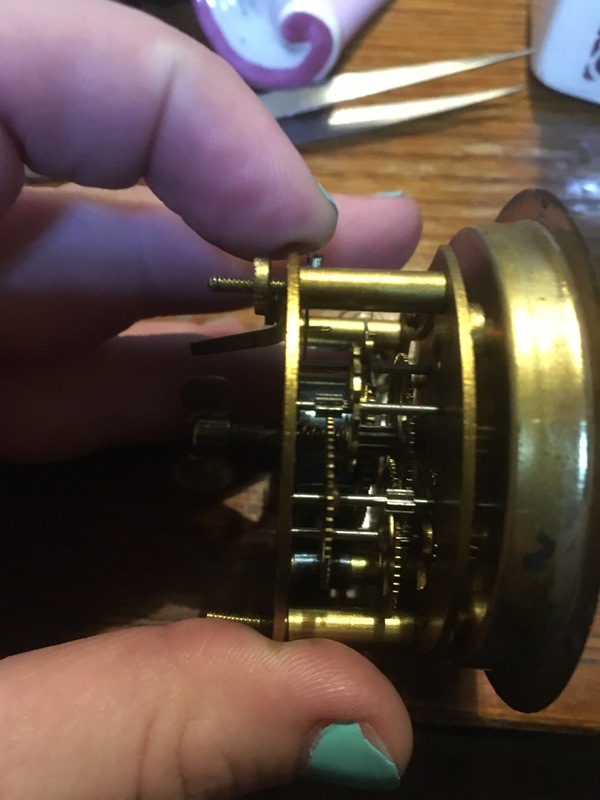 The above picture shows the clock with all the gears removed save for those that are locked in place and run the clock hands. The center upright axis is the central axis of the clock on which the hour and minute hands are connected. 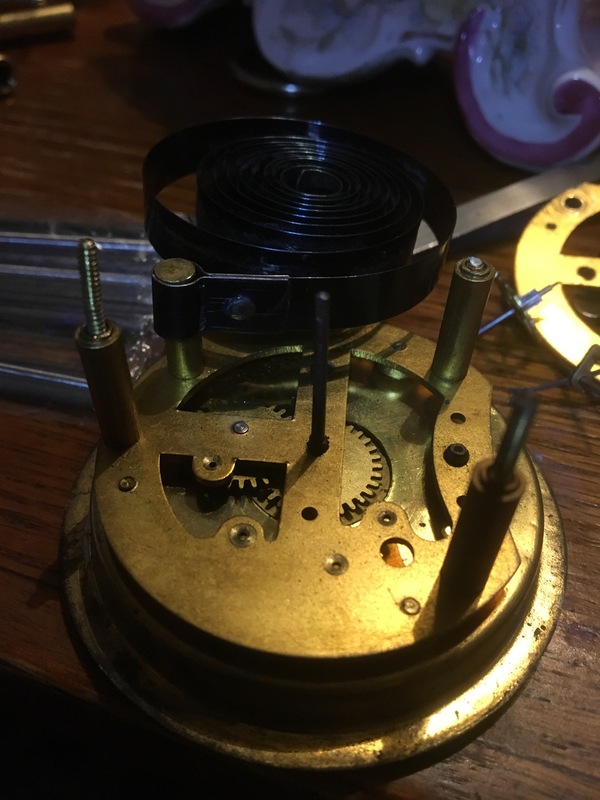 Now for the bad part – the gears inbetween the dial and the plate shown are not moving with the central axis. 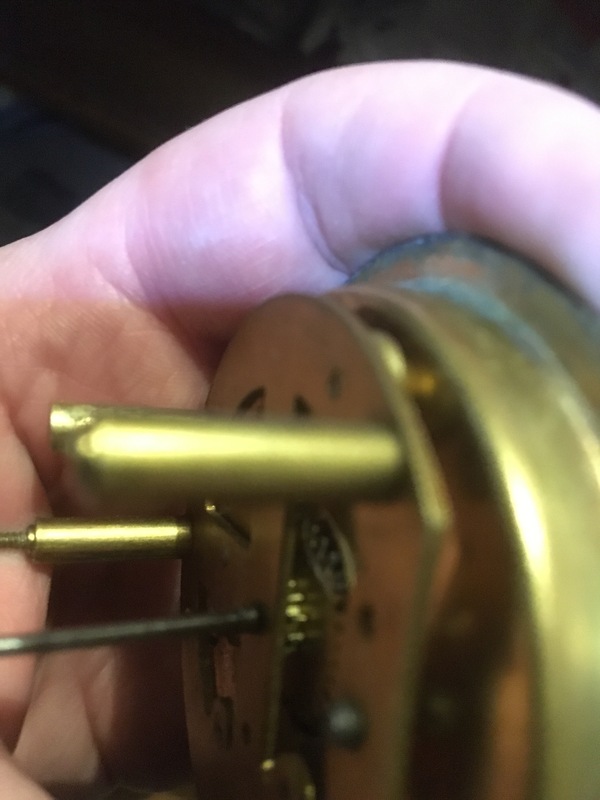 There is a smaller pinion gear and a larger planetary gear and they both seem to come loose from the central axis when under pressure. Something is not right. Unless I can get in between those two faces I won’t know what it is. Figuring out how to get them apart is tricky so far – I’ve tried a combination of long tweezers and needle nose pliers to try and unscrew nuts on the three posts holding it all together with a moderate amount of success. However it looks like the ends may have been spot welded to prevent accidental breaking, and the nuts left on as space holders. 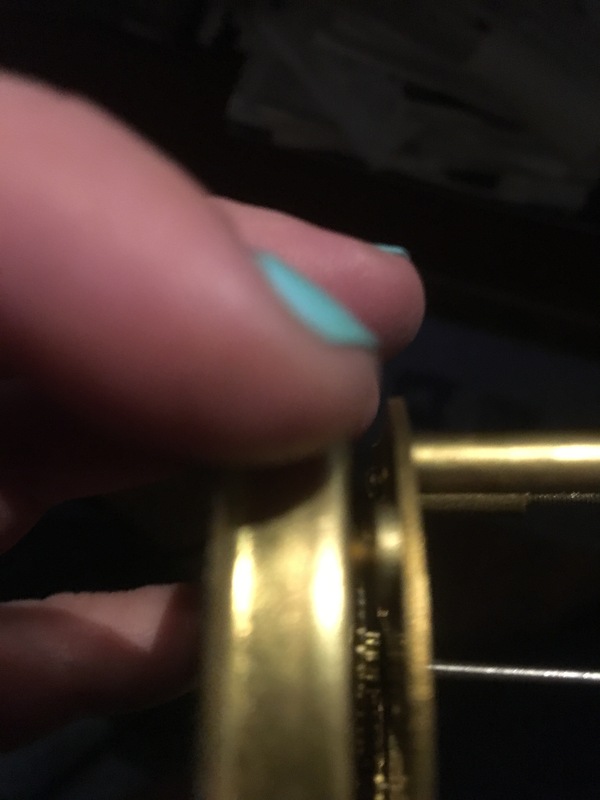 I’m going to sleep on it and reattack the problem tomorrow, likely with a magnifying glass this time. These parts are small!